Find and read all the latest Smart Shuttle Line reviews from fellow bus travelers. These verified Smart Shuttle Line reviews have been submitted from real customers who booked their Smart Shuttle Line tickets on GotoBus.com. The customer reviews evaluate Smart Shuttle Line service by rating different aspects such as the bus cleanliness, punctuality, staff and bus comfort. We hope you find them helpful! Find out more about the GotoBus customer reviews program - we look forward to your review! Contraté un servicio el 8/1 7 Y 10 de la mañana en un estacionamiento de osceolla pwy. Estuve desde las 6 y 45 hs de la mañana y cuando llama al número de contacto sólo me atendía una máquina. Sólo acudieron que pasaron y no estábamos. A todas las personas que estaban ahí esperando otros liceos también pregunté y nadie había escuchado nada. Lo único que se es que yo estuve con mi familia en ese lugar indicado y nos dejaron sin viajar a Miami con pasaje ya pago y sin aportar ni la mínima solución desde la empresa. El driver muy grosero y falta de respeto cobrando $7 por maleta. Como no tenia el dinero en cash se molesto y me dijo que podia usar la tarjeta pero que me iba a cobrar $8. Si es asi coloquen esa informacion en la pagina para uno estar prevenido. Why Do I have to pay a fee for my carry on,the driver asked yesterday otherwise I would not board. We cannot eat on the bus, and a 4hrs long ride we only get 10mins stop to do everything. The bus could have been a lot more comfortable....seats were not soft at all and we were literally sitting upright for the 5hrs of the journey from Miami international airport to international drive orlando....it was devastating on our backs. Once we got to the drop off area at the airport, he pulled over blocking cars off to yell at ride and another car for “being in the spot he pays for” instead of simply pulling up, and he was fishing for a tip and gave me attitude because didn’t give him one. Bus was perfect. Why i didnt like was the personel. I called to SSL because I forgormt a item on bus they told me they cant call driver. They didnt give me any way to solve the problem. They said all time "we cant respond for whatever you leave in bus". I didnt like this way to treat costumer. I recommend Smart bus it's awesome. I did not it was a van but it was ok after all. I had a bad experience yesterday when I was inside smart shuttle line from Miami to Orlando the bus was hot the air condition is not working. Great overall service. No complaints. Un engaño, en las especificaciones indica un autobús con baño, con comodidades, y cuando vamos a montarnos es un vans porque no vendieron la cantidad de boletos necesarios, el wifi dura 30 min! The AC was poor and there were no charging ports available and I didn't even bother checking to see the WiFi, if there was any. I spent the 4 hour ride uncomfortable and sweaty. The driver was really rude! Great service . Bus driver very accurate and nice . The best one this site has to offer! Very punctual, clean and simple. Wifi didnt seem to work but fine if you just want to get between Miami and Orlando. The bus we had on our outbound trip from Orlando to Miami was much better. This wasn't a bus, it was a van. It was very cramped with no headrests. It wasn't suitable for a 4 hour journey. There was also no wifi on this bus and this was listed as a feature when we booked. + affordable, friendly driver - AC not working properly, advertised free wifi is only for 21 minutes. Bus was really clean and comfortable. Spot on punctuality. After stop to use restroom and get food, driver did a headcount to ensure no passenger was left behind. Wifi on board is great, but could use some charging ports for mobile phones. This bus was small and the seats where uncomfortables for a long trip. I just didn't appreciate the fact that the driver left the airport five minutes before the time scheduled. I had an issue with time with an earlier bus and I lost 20 bucks because of that. So, I'd advise you guys training your drivers to leave as the according time, not any minute earlier. Anyway, besides that, the driver was nice. Service was very good. Everything ran smoothly. Very comfortable. Would ride again. Thank you! Good staff in that company. The bus was punctual and easy to connect with. The driver seem to understand little english, which communication challenging. The route that he took added about 1hour to the trip than stated. I'm not sure I'd use this shuttle service again. We travelled by Van with Trailer Orlando-MIA Airport. Everything perfect. Jorge the driver is the best person in the smart shuttle line.! Keep going your job.! Very good experience,it is so easy, only the station of Kissimmee is not easy to be found. Great service, you need more trips. Great service I wouldn't hesitate to recommend more. The bus was 1 hour late. No excuses because of it. When I asked the driver, he doesn't was interested in give me a convinced answer and at the end, he said: "If you don't like it, tell it to the company" . It took us half and hour more to arrive to Orlando where there were people waiting for us. The bus was suposed to arrived at 4:30 and it arrived at 6 pm. I will never travel with you anymore. I will be a frequent travel with GotoBus Service company every weekend I will be travelling. How can I get discount fare or promo code for my trips. I enjoy my trip with you. El bus fue muy puntual, estaba limpio y muy economico. There was no space on the bus. They squeezed more people than they could. Putting 4 people in a 3 people seat. Also one of the passengers was super rude the entire ride offending other passengers and the driver didn't do anything. The driver spoke to him once and it almost broke into a fight. The passenger was starting fights with everyone and should have been removed off the bus because he was intolerable. Also there was a passenger with 2 dogs in an already super crammed van. Someone could have been allergic to the dogs but the question of allowing the dogs to sit with the people was never asked. buen precio y buen servicio lo recomiendo. 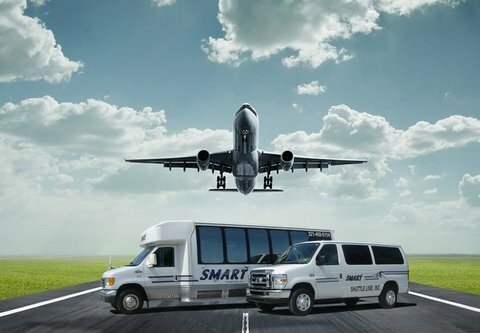 I had a nice experience with Smart Shuttle. Very affordable price, super spacious with reclineable seats. My trip was from Orlando - Miami with 3 stops, one of 15 mins. Quick trip overall.. I would consider Smart Shuttle again! Thank you guys and keep up that great service! Everything was perfect, except for the very cold air conditioning. The AC did not work properly, however the rest was all good. The summer is very hot. I had a window seat and was very uncomfortable due to the sun beaming on me. Maybe window blinds can assist with sheiling travelers from the sun while on the bus. Driver waited for us when he did not have too! He was outstanding! I wish we had outlets. AC too high. Some times quite fast the driver. Excellent punctuality. I am very satisfied with your professional services and will recommend your company to all my friends, fans and followers on social networks. Thank you! Hollywood to Orlando the car was really uncomfortable, there were a lot of people in a small car,even thought the driver was very professional. Great, but 15 minutes late to arrive. I know something happens. Comfortable ride, smooth and quick. Bus was a little dirty between seats. Driver was awesome. Very understanding and patient. The shuttle was freezing the a/c was blasting and there are no charging outlets available. I had to ask driver to use the plug up front to charge my phone so that I could get picked up from the bus and he acted as if it was a problem that I even asked. He also gave a speech encouraging tips for the driver which made the passengers feel a bit uncomfortable and pressured considering we already bought our tickets for the ride and didn't have cash on hand. Great service !! on time !! Amazing service ,my granddaughter was very happy she said you are the best. Not sure if it was because of my I pad but I kept having issues login into Wi-Fi. Besides that I enjoy this ride better than my first trip on a regular Van. Pleasant and fast will use them again. I am satisfied with the service and will Definetly use it if I need to travel in the future. I bought online a ticket for a bus Orlando-Miami a day before departure which was scheduled at 12:30am at the McDonalds in I-Drive in Orlando. There was no exact location of the bus stop indicated in the gotobus site, only the address of the restaurant. Therefore I arrived at the McDonalds well in advance at 12:05, asked several people around where the bus stops and started waiting in the street just in front of the restaurant as I was told. There was no bus arrived up to 12:35 and I called the company in order to get some information. In response, they explained that the bus was waiting for me in the parking of the McDonalds at least 100m away from the restaurant and that they tried to call me but did not manage - which was correct, since I erroneously put in the reservation form my business phone number. Meanwhile the bus just left and I lost my money - no refund was possible. In conclusion: 1) bus companies need to indicate the exact location of the bus stop online, and 2) customers need to put their cellular phone numbers in the registration form to be called on if required. Great speedy service!courteous and on time! The travel was fine and really useful (the arrival stop was just in front of our hotel). However, we expected a coach bus, but it was just a shuttle. Nevertheless, it was a good trip. Lorenzo is an excellent driver very responsible, humble, friendly I really had felt so glad to travel with you and in the future I will continue using your company to travel thanks.I give 5 stars to the drover also. Si bien no está bien en claro donde te pasa a buscar el bus, salio todo perfecto por suerte. Recomendable y económico. El servicio no me parecio adecuado. Por dificultad con el trafico me retrase 2 minutos y el me dejo. Esto fue para mi un inconveniete del servicio. No hay telefono para comunicarte con el conductor. La empresa no se hace respnsable. great trip. Driver very friendly. well worth the money. Great service. Punctuality on time. worth every Penny. Driver very helpful! I take the bus all the time & at the end when I got off the bus & got my luggage the gentleman said "I guess I was a bad driver" talking about a tip. I found that rude b/c I didn't have money to even eat at the stop. Directly from Orlando to Miami airport. So good and very convenient. Wifi didn't work. The bus was a little smelly but the carpets were clean. The driver did not stop talking to a passenger the entire ride so it was impossible for anyone to fall asleep. I was told I would arrive to my location by 10:35 and I didn't arrive until 11:45.
again amazing!!! I take the bus all the time. & arrived exactly at 10:20am. Happy customer will be back soon. 9/1/2015 Orlando to hollywood 7am. I forgot the drivers name but that the date & time so hopefully he gets praised for an amazing job. Driver was so polite! That's why I always & ONLY ride with smart shuttle bus. I was scheduled to reach at 10.45 to MIA but I reached there late after 11.10 and was late for my appointment. This bus was on time for departure and although we hit horrible traffic when we arrived to Miami the driver was still diligent in getting us to our arrival destination as best as he could. Wifi included on shuttle and friendly driver. I actually I missed the bus, been trying to reach customer service and I havent been able to get in touch. Nice smooth and safe ride. The driver was nice and professional. I arrived on time, I'm very satisfied. The best service of the world. Very polite operator, just a little late agter fiftern minute stop. The driver was soo great and help us with the luggage and anything we needed. Me gusto mucho buen servicio. Good thing it was WiFi and charging station onboard. The bus was in perfect time, and in good condition. I recommend. We found this shuttles at last minute and we were desperate. Finding this service was the best. The shuttles were clean, the staff was friendly and understanding. Everything was efficient. There was air conditioning and the shuttle was spacious and clean. I am around 6 feet so I am always cramped in the buses but this was great and really affordable. APART FROM PUNCTUALITY, I WOULD RECOMMEND IT FOR ITS PRICE.